I created this card for my swaps for the Stampin' Up! convention. Forgive the hand in the photo but I was trying to snap pics quickly the evening before I left for Salt Lake City to post on my Facebook Page and to post here for you. You can follow my Stampin' Up! page on Facebook by clicking on the Facebook link in the side bar. I looked and looked and could not find my original inspiration for this card. If it was your card please email me and I am happy to give you credit. I had seen this idea for cutting a card from the Floral Framelits and took off with it. I added lots of texture and wanted it to look realistic so I did some distressing and "scrunching" on the petals. Place your framelit on your paper so it's hanging off the folded edge as shown above. That will create the actual card. This is a half sheet of 8.5 x 11 sheet of paper cut on the short side. On my swaps that I made for convention I tried to be frugal with my paper by still giving folks the idea but not the full card so they got just a quarter of a sheet of cardstock to give them the idea of how to make it into a full card. This is what it looks like when you do the full card. What a difference! I love how it all pops! Here are a couple of shots of all my pieces for the swap. I made 100 of them. It's always kind of a mess when it's in progress but always fun when they are all put together. Here are a couple of messy pics. Then I took 20 of those card bases and made the butterflies into pins by punching 2 extra butterflies (not stamped) out of the same Pumpkin Pie paper and gluing them together with our "green lid" glue or Tombow liquid adhesive as it's officially called. Then I covered the top of the butterfly with crystal effects. I love crystal effects it makes everything get all shiny and beautiful. To finish out my butterflies I put a little wire antenae on them, a pin back and a jeweled rhinestone. Then I punched a couple holes in my card and pinned them on. I am hoping to trade these for some adorable 3-D items. I have never taken the time to make 3-D items so I am looking forward to trading them. Here are a few shots of the butterfly pins along with the completed project. Close up so you can see the shine! Here is the completed pin card, so pretty out in nature! There was a struggle between M.E. and both of my girls on which card was "the" card. Here were the choices....my choice won out! Ha. Actually my youngest Abby helped me so she made her's her way and I made mine my way. I think they were both good choices. Blossom Box~It IS the gift! I'll tell you what my first impression of this new Big Shot die was not favorable. Yes, I admit it. I thought to myself, that looks very fussy. It looks like it will be difficult to put together. Do I really want to spend that much time fussing with a box? Then I went to convention and one of the presenters demonstrated the box. She even mentioned the word fussy. Nope haven't changed my opinion yet. Then last week I was able to get one item out of the catalog at half price. Okay, I thought, for half price I will see just how fussy this box really is. Well, I am getting ready for an upline meeting this Friday and my 12 year old Daughter Abby was wanting to "craft" with me. She has her own desk in my studio and frankly could be a Stampin' Up! demonstrator as she has been doing it as long as I have which is since she was 3.5. She often times will sit next to one of my customers gently giving them tips and hints when they are struggling with an element. She joins us at all of my downline meetings never skipping a beat, or slowing things down when we are working on projects, sometimes even teaching us a trick or two, but I digress here. She was looking for a "project" as she calls it. I said "here" and handed her the unopened die. Her eyes got really big and she said "Really?"! I said "yes", give it a try with a piece of retired Designer Series paper as a practice. So off she gets to work. She carefully read the directions (something we often forget to do) and with a little help locating my crease pad (I highly recommend it for this die) she was off to work. She needed very little help. We discussed which way the creases should be folded and she was off and running. The box went together beautifully. So guess what I did. I handed her some new DSP from the Well Worn packet and said here make it out of this for me. Here is the results. I did a little sponging on it and added a few elements. Voila' Adorable! So the moral of the story is....yep, if a 12 year old can do it...so can I! I mean YOU! The flower is one we made at my downline meeting last week. At convention I purchased a DVD that was available to us called Workshop Wow. It had demonstrations from all over the country. This was one that Sharon Cheng showcased at the Fort Worth regional last year. The flower is created using Coffee Filters. Yep you heard me right. It is a coffee filter flower. Of course as I do I took her idea and tweaked it. We used Aqua painters to give our flowers more of a watercolored look. Here are some of the flowers my girls made that evening. I took the picture with my iPhone so forgive the quality. But you get the idea. Isn't the variety gorgeous?! I love the choices of color and the difference between the number of petals and if you scrunch this way or that. My daughter Abby really loved them and this week she has really gone to town creating. I challenged her to think outside the box with color and punches. She stepped it up to the Big shot and yesterday when her Aunt was visiting she said..."Just a minute" with her finger raised high and ran to her craft area. She came back with a flower magnet for Aunt Joy's fridge. It was beautiful! I didn't get a picture of it but I know Aunt Joy will love seeing it on her fridge every day! Makes me long for those days before Stainless steel! Ha Ha. 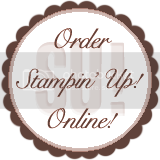 So, if you want to give it a go or want to learn how to earn it for half price too, click on my signature box to go to my Stampin' Up! website. Field Flowers~Two Step Stamping at it's BEST! One of my new favorite sets in the catalog is Field Flowers. I love the two-step stamping element to it. This is one of the cards we created using the Field Flowers set at this months class. I was inspired by a swap I received at the Stampin' Up! convention last month and I tweaked it. Calypso Coral is not one of my favorite colors. I never say that about Stampin' Up! colors because I just LOVE color and usually love them all <call me a color hound, I'm okay with it> but coral just has never been one of my favorites. When I said that to someone recently they told me it was because I was a redhead. Well not sure if that is true or not but I will accept that reason. Actually when creating this card for class I fell a little in love with it. Well, in-like anyway! Back to School~the Extreme Way! Last Sunday at Church a friend of mine, Sherry, asked if I would bake something for Restoration Urban Ministries for a bake sale they are having tomorrow. Before anything came out of my mouth my oldest daughter Hannah chimed in and said...."That's what she does! My Mom loves to bake!" Yep she's right I do love to bake especially in my new kitchen. It's such a joy now to bake! I will have to share pictures of my gourmet kitchen that my husband created for me some other time because I have so much to share today! Here is a picture of what I have made this morning in my kitchen and my studio and it's only 10am! I started with 4 loaves of Ezekial bread. It's a honey wheat bread. It's delicious. I am so thrilled that my friend Cindy shared this recipe with me. My family loves it! The only downside to this recipe is it makes 4 loaves I usually freeze 3 of the loaves and bake them one at a time but at 7:30 this morning I was running over to my friend Sharon's house to borrow two loaf pans from her. She was my lifesaver today! Thanks Sharon. Restoration Ministries thank you too! I have an upline meeting tonight and I always bake cookies for the ladies so I thought I would just make a double batch and have some for tonight and the rest can go to the ministry so here they are. I pulled out an oldie but a goodie. One of my husbands favorites (I might have to tuck away a few for him to have after work) it's his aunts Chocolate chip Oatmeal cookes although she just calls them chocolate chip. They even have a little coconut in them. I would call them kitchen sink cookies as everything Yummy is inside! Sorry for showing all the mess too. I went grocery shopping last night because I have had a sick child at home all week and just couldn't get away during the day so by the time I got home last night I was beat and what didn't go in the fridge didn't get put away...yet. Oh these cookies are so yummy. You would be proud of me...I haven't even eaten one...YET! saving it for my lunch. tehehe. OH you want to see a little stamping too? Golly Gee Go Figure! Well, I do have something to show you. 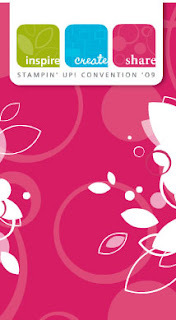 I totally CASEd (Copied and Stole Everything) from Shelli Gardner our CEO of Stampin' Up! She showcased this at Convention last month and when I saw it I knew I had to recreate it for my uplines meeting. I am in charge of getting demonstrators together to show some new ideas and usually I can't help but show something myself. ok if you know me you understand this statement. I sure hope they don't get tired of seeing me. And if are coming tonight and read my blog...act surprised! But the stamper in me says I can top that! And if we want to give them as a gift we can make this cute reusable cylinder to keep them in. I stepped mine up a little by covering them all with Crystal effects. I think this will make them a little more sturdy to hold up all year in the kids lockers. I can see this made with all kind of sets. I punched the window with the Wide Oval and covered it with a window sheet. The top and bottom are made with the bottom of the Baskets and Blooms Big Shot die. The cylinder is a 6 1/2 x 5" piece of Confetti Cream and the best way to make the lid fit as well as the bottom is to actually make the top a hair smaller than the bottom so they lid slips easily on and off. It's barely noticible to the eye. I love the way the Crystal effects made the images run a little giving them all a Rock Star quality. The guitarist has a little aura around him. It's very cool. I took a rhinestone brad and tore it apart and dropped the rhinestone into the crystal effects for a cool embellishment too. Hope you enjoy. I need to go stamp some cute tags for my baked goods...hey a woman has to always be promoting her business! No reason why my baked goods can't have my Stampin' Up! touch on them and maybe my website....tehehe. I'll try to post a picture if I am successful. If you want to duplicate this project you can order online 24/7 here. Anyone who is long distance that earns this honor is allowed to make their projects and mail them so there were 8 gorgeous WOW projects already waiting for us! I hope to show many over the course of the next weeks. Then we got to move from station to station stamping all night. It was a lot of fun. Sometimes as demonstrators we don't take time to just stamp for ourselves. If you can't tell this was a real JOY to me! Especially after a day of complete interuptions. Anyway I knew what project I was going to do because my friend Rachel turned to me during convention, while Shelli, our president was stamping on stage and said "You ARE going to do that project for your APEX!" So you bet I did that project, not without second guessing my commitment though because the pattern they provided us online was not to scale and I had to increase it but not the easy way, I had to redraw the whole thing! Wanna see a picture? It is a cute little note holder but a little different in the way you fold it. It takes a full sheet of 12 x 12 paper because you put the pattern on an angle and then cut. The folding is a little tricky but not hard. Just make sure you make the corner folds mountain folds and that you leave the one with the extra paper flap to fold in last to cover the first one so it makes a nice clean edge. Maybe these pictures will help you understand a little better. Below is a picture of it fully open with plenty of room for 4 little 3 x 3 gift cards and envelopes. If you want to make this in a private stamping class at your home (or in my studio) with your friends call or email me and I will teach you step by step how to make this great holiday gift. Of course you must live in Champaign-Urbana, IL or the greater sorrounding area! Move it and lose it!~lessons learned from a 2yr old. I have a little friend Tucker, who is just the cutest thing. The other day I was at his moms house (my Stampin' Up! Upline) and we were doing a little blog learning (on my part). I got up to go plug in my computer and before I could turn around Tucker had climbed up into my chair and was ready to be my new IT person! You know kids can teach us a thing or two when it comes to computers. I just couldn't resist sharing this picture of him since I think he's so adorable. He even made it on to the big screen at our Stampin' Up! Convention. His mom made the most adorable video of him "working" with our Big Shot. She turned it into a "commercial" for attending one of our regional events and they picked it as a winner! You can view the uncut video here. I also have to show you a stamping project. This is a little shower favor I made for my neice Melissa's wedding shower last month. I had to make 50 of these. They got rave reviews! They are cut from the Box #2 die with my Big Shot. Then I embossed them with the new Elegant Bouquet Textured Impressions embossing folder. They had to be run through twice to cover the whole box. Giving them that extra wow! You can't tell from the picture but the item inside is a plantable butterfly that has wildflower seeds in it. My Neice is trying to do as much "Green" with her wedding as possible. What you don't see is that I had 3 pansy chocolates from Fanny May in the box too...I ate those already! :-) The whole package sat at each ladies place at the bed & Breakfast where we held the shower. The day was just perfect! Taste of Convention Sneak Peak~Now that's some project! I'm just dying to show you Friday's Make n Take Projects! Lots of techniques on these projects. You will get to cut out a new box pattern and envelopes with the Big Shot. Texturize paper and even cut wood! these projects are just the cutest and you can go home with it all this Friday at my Taste of Convention event all for FREE! Email your RSVP Right NOW! What's the Most Popular Stamp Set you ask? When I went to our Annual Stampin' Up! convention last week we all found out what we probably already knew, that the #1 selling Stamp set out of this years catalog so far is the Medallion stamp set shown here. Notice I used the new Rich Razzleberry ribbon but I didn't think the polka dots would compliment this card so I turned it over and it worked perfectly! It's one of my favorites and first on my wish list when I received my new catalog. That's why I featured it at this months Forget-Me-Not Card keeper class. And just a reminder but if you want to see some of the great new product and Ideas we learned at convention don't miss my Taste of convention event in Champaign Friday evening. Bring your camera there will be LOTS to see and take pictures of along with 6 make n take stations! This is something new we are trying and I think you will LOVE it! Taste of Convention-Friday August 21st! Do you live in the Champaign, Illinois area? I hope you're free on Friday night--you won't want to miss out! Wish you could spend 4 fabulous days doing nothing but STAMPING?! That’s what we do at the Stampin' Up convention in Salt Lake City, and we’re excited to bring the experience home to you in Champaign! Don’t miss this fabulous FREE event, and a chance to see what we learned. • SIX (6) FREE Make N Take Stations, you take them all home! Plan to stop by after work! Bring a new friend with you for an extra bonus gift. You’ll want to be sure to bring your Wish List along with you so that you’re ready to put your order in – the drawings begin at 6 pm and each $15 you order gets you an extra chance to win FREE stamps!